I was born in 1965 into, in many ways, a pretty typical 1970's American family, with the exception of some family alcoholism which did have many detremental effects. We worked hard, I attended school, I graduated and at 21, joined the U.S. Navy and served in the engineering department on a Guided Missle Cruiser. I didn’t, by the grace of God, follow in the footsteps of alcoholism and wasn’t the wildest guy in the navy, but I was certainly a person with wordly values. I lived for myself. I didn’t have anything against God, but I certainly didn’t want anything to do with Him either. After all, I liked my life. I was a proud man; I did what I wanted, lived an adventure traveling the world and thought I was basically a good person. So one night, on May 19th or 20th, 1988 at 3 am, when I was on the midnight shift on board ship with another guy having coffee and he asked me if he could talk to me about Jesus, I was polite but direct. “NO THANKS!” I just didn’t see a need. Why would I give up control of my life to some mystic God. It made absolutely no sense. Little did I know that I was about to embark on a new adventure that would change my life forever! Days later, on the evening of May 22 to be specific, It was time to work another late shift. I was heading to the ship from my apartment. (we were in our homeport) I was on my motorcycle with a friend and he had been bugging me to drive it and for some reason, this particular night, I let him. As emergency personel showed up, my friend was conscious and speaking, I was uncounscious and without a pulse or breathing. They attempted to revive me and rushed me to the closest hospital. They revived my heart and breathing by the time we arrived at Virginia Beach General Hospital and in the emergency room, they assessed my condition. They determined I had a concussion, 2 shattered vertebrae in my neck (C-4 and C-5), leaving me paralyzed from the neck down. I also had a lacerated heart, crushed organs including my lungs, spleen, kidneys, liver and pancreas. Other broken bones included a broken pelvis, ribs, shoulder blade and numerous other smaller fractures and laserations. They rushed me into surgery and 3 surgeons worked at the same time to try and stabilize my condition. I survived long enough to be placed in Intensive care in critical condition. It got worse. Over the next couple of days, infection and pneumonia set in. Swelling left my lungs uncapable of functioning and I went back to surgery to have a tracheostomy performed and I was put on a ventilator. I had 12 drainage tubes in my body; 3 in my lungs and 9 in various other places for drainage. I had an incision from my chest to my groin which was left partially open. My head was secured to the bed with weights to secure my neck and the bed rotated to help prevent my lungs from filling with fluid. My brain was a fog; I had no idea where I was or what happened and now I was unable to speak. To say I was scared would be an understatement. Over the next week, things continued to get worse. My lungs were continually filling with fluid and whenever they would empty them my heart would stop and I would have to be resussitated. Fortunately, I only have one memorty of that. The terror of having that happen when you can't move or speak cannot be put into words so I will not even try. Finally, it had happened 2 times in an evening and showed no signs of stopping. The Dr. prepared my family, who were now there, for the obvious; that I would not survive a 3rd time and it would probably happen any minute. As they waited, something else was happening. A small, routine prayer group was meeting at a Methodist church in Shawnee. I was on their list. I know this because I recieved a "prayer gram" in the mail stating the date and time they prayed for me. I still have it. The date and time was this particular date and excact time that my family was waiting for me to die. My medical records indicate that about 10 minutes after the doctors gave my family the news and that prayer group prayed for me, I went from being barely concsious on my deathbed to sitting up complaining of being “hungry.” And after that moment, I began to improve, though slowly. But even with this improvement in my condition I still had big hurdles in front of me. 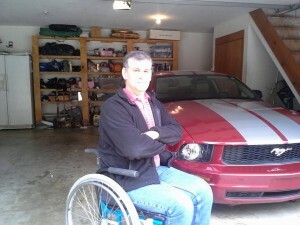 I was paralyzed from the neckdown and doctors told my family I would be that way for the rest of my life. But during the next several months, as my condition began to stabalize, I noticed I began to move 1 finger, just a little. I knew nothing about God, but I took it as a sign that He was going to help me. But, no one else shared that optimism. At this point, my condition was stable enough that I needed to be transferred to a Naval Hospital. But things did not go well there. They were not equipped for the severity of my injuries and my condition took a turn for the worse. Infection had returned as well as pnuemonia. After talking with many people, my parents learned that there was a Veteran's Hospital in memphis, Tennesee with the facilities to care for me and my rehabilitation. But the Navy official in charge would not release me. I never found out why. My parents were desperate. No one would listen. My dad, on a hunch, pulled out his wallet and searched through the many pieces of paper that men's wallets seem to accumulate. He found an old business card and pulled it out. The name on it was "John." John was an investment banker in Memphis. He had given the card to my father a few years before. It seemed John and his family had broken down on the freeway in Oklahoma and my dad, on the way home from work, had stopped and helped them repair their car. As John and his family prepared to continue their journey, he gave dad the card and said, "If I can ever help you sometime, give me a call." So, as an act of desperation, my father called the number. He reminded John of who he was and asked if he knew anyone in Memphis who could help. As it turned out, John was good friends with his congressman. It also turns out, the congressman was on the Armed Sevices Committee. So the next day, a somewhat apologetic Naval Commander signed the order and I was transferred by plane immediately to Memphis, Tennesee. Eventually, after many months, my condition stabilized enough to begin physical rehabilitation. They determined that I was always going to always be paralyzed from the neck down. I should focus on accepting my condition and learning to live whatever life I had left in the best condition I could. By that time, I had also acquired an addiction to morphine and valium which I had been given in heavy doses for quite some time. I was scared and my brain was a constant fog. I wanted to walk again. It seemed like an attainable goal (which I'm sure it does when you are taking heavy narcotics) and anything else was a waste of time as far as I was concerned. I became a horrible patient there. I began to weed myself off of the narcotics. It was very painful and mentally stressful. I was also coping with PTSD, but we didn't have that name for it then. I refused to do their "readjustment" classes until they started giving me the rehab to walk again, and they wouldn’t do that because I was too unstable to try. You couldn’t blame them for their position. I’m sure every person that came in to that hospital had those hopes and to them, I was probably just another person who wouldn’t accept the obvious. They even brought in a phsycologist to try and convince me to give up and accept my condition. I felt like I was alone against the world and in many ways, I was. So I made them my enemy and we battled for weeks and weeks turned into months and finally, they labled me an uncooperative patient and discharged me. I got the last laugh though. 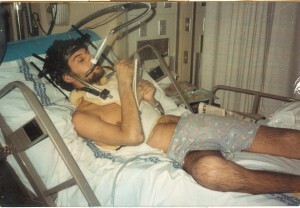 Upon leaving the hospital, I stopped in front of the nurses desk, got up and pushed my wheelchair out of the hospital! I wish camera phones would have been invented because the looks on their faces were pricelss. But let me back up a few months. Over time, movement began to slowly return, and I would excersise, on my own, whatever I could. The feeling in my limbs never returned. But slowly, the movement did. Since they wouldn't let me do physical therapy with my legs, when the nurses put everyone to bed, I would wedge my chair between the wall and the bed and try to pull myself up and practice standing, and eventually stepping. At this point I had absolutely no feeling from the knees down, but the muscles worked enough that I could work out and get stronger as time went by. The grace of the almighty God had blessed me again even though I deserved none of it. During the quiet moments I would think about God and I even looked at a Bible a couple of times. Deep down I knew God had something to do with all of this, but I didn't know why. I just didn't understand much more at that point. For whatever reason, God liked me and that is as far as I would pursue it. So, after spending some time in Memphis, I went back to Oklahoma on an emotional high, ready to conquer the world. I was working out on my own and was actually walking pretty well for just being 3 years or so since my accidnt. I enrolled in college to get retrained and got married to my wonderful wife Jamie in 1991. But I would be healthy, then sick and eventually I developed a problem with my foot that, in 1992, had put me back in a wheelchair. After about 8 months of struggling to fix it, they finally did surgery that would fix the problem by removing the bone in one toe and replacing it with a metal rod. After waiting about 2 weeks, the day had finally arrived to remove the stitches. On the way to the doctors office, a truck hit the car I was riding in. My feet went into the floorboard and the rod came out of my foot and also refractured my shoulder blade. I recovered physically, but something changed in me, mentally. I started to fail. I became bitter and isolated. I began to wonder about this God issue and why he would lead me so far, only to abandon me now. Hadn’t I been good enough. What did I have to do to earn his favor again. Eventually, things got better, but I was left with a void. This God issue kept bugging me and it needed to be dealt with. My wife, who was raised a Baptist but had not been involved much since our wedding, suggested maybe church had the answer. We looked around and finally attended a small country church in Shawnee called Aydelotte Baptist Church. The friendly people were annoying (I had become quite the antisocial person) but I promised Jamie that I would, at least, listen to the sermon. I still remember it to this day. it was on Romans, Chapter 5. 1 Therefore, since we have been justified by faith, we have peace with God through our Lord Jesus Christ. As I thought about this, I realized, it wasn’t about how good I was, I couldn’t be good enough. When left to fend for myself in life, I literally died. But 2000 years ago, Christ died for ME while I was STILL A SINNER. I didn’t deserve it. There was nothing I could do. I thought of my middle of the night encounter where I denied Christ. But this time, a light came on in my heart. I could see what I couldn’t see before. HOW BLIND I WAS. As I studied this point it became clear. God will not tolerate sin, not even one. And the penalty for sin is death. And that penalty must be paid. Even worse, no one, from the beginning of time with Adam and Eve til the present day, no one has lived sin free….no one, except jesus! Jesus, the Son of God, was the only person ever to live a sin free life. He had a punishment free trip to heaven. But instead, he hung on a cross and suffered a hoorible death. But why? Verse 8 tells us. He died for us. He paid our penalty. He paid my penalty, even when I denied him. That’s the definition of grace. I, in absolutely no way deserved for him to pay my penalty, yet he did it anyway, out of love for me. Jesus had saved my life, both in this life and for all of eternity. He had been with me, carefully watching and helping me. I had recieved physical healings, from God. But the most important healing that I needed I hadn't recieved yet. It was time to heal my heart! It was time to let go of self-pride and accept the gift that only He could offer. I had to act. I contacted the pastor of the small church we had visited and in his office, the next day I said the sinners prayer, I dedicated my life to Christ and was baptized. My life continued to grow after that, at times the easy way and at times, the hard way. I wish our walk as Christians could be all fun and happiness but as we read in verse 3, though we may be able to rejoice in our sufferings now, we still have them. And around 2002 I was to endure more. My neck vertebrae had deteriated to the point that it was affecting my nervous system again. I had to have a surgery where they removed 2 of my vertebrae out of the front of my neck, then took some of my hip bone and made new ones and put them back in, and then used a piece of titanium to stabilize it. The surgery was a success, but it left me in bad shape physically and I had to go back to a rehabilitation hospital. I’d like to say I was excited to suffer for the lord, but it was hard. I wondered what the purpose was and at times, it was a bit depressing. I was feeling like I had to start all over again. But I persisted, purely with the Lord’s help and soon after I was discharged and began to resume my life. That is when I read an advertisement for a ministry who was selecting a certain number of cyclists for a 3 day cross state ride that would raise money for their national effort. I was not a cyclist and the last thing I should have ever considered doing was ride a bike over 180 miles. I could barely walk, let alone take on a project like that. But I felt a call to do it. So I bought a bike, trained as best I could and trusted God to take care of the rest. So on april 5th, 2002 I lined up with the other riders selected and I rode.That first day I rode around 60 miles and as I rode up to the finish line I found out the local media had picked up my story and wanted to speak. I spoke with them and they filmed while I sat on my bike, and then I was helped to my room because my legs were exhausted. I wondered how I would go on. The next morning I was still tired but felt like I could continue. So we took off and did around 70 miles and by the time we reached the finish, I was done. I couldn’t move. I was scared, defeated and knew I could not go on, on my own. That night, my wife and I prayed knowing God would have to carry me on. That last day, we were scheduled to do the last 65 mles. As we approached the start zone I began to feel OK. As we took off, over the first couple of miles I felt renewed. Clouds turned to rain, which turned to storms, but I didn’t want to quit. So I rode, with God, I just rode. I didn’t know it, but the organizers had pulled people off the road til the storm let up. But I had got far enough ahead that they couldn’t find me. As we regrouped for the finish, there was one obstacle left. A long, steep hill. As I attacked it with everything I had, I made it up the first half. I was determined not to quit, but as I neared the ¾ mark, I quickly lost strength in my legs. I wasn’t gonna make it! I begged God for an answer. 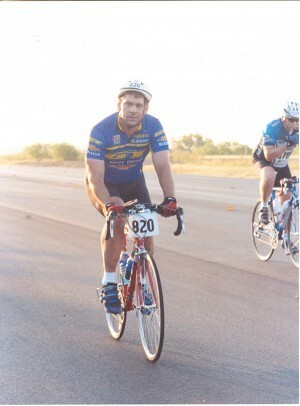 It seemed very important to me at the time to ride each day from start to finish without stopping. Just when I couldn’t make it any farther, I came to a circle bank drive which I was able to turn into and ride around once, giving legs what they needed to finish my journey, without stopping. As the media interviewed me at the finish, I was able to give glory to the Lord, as well as those Christian people who had supported and mentored me since my conversion. As romans 5, verses 3 and 4 says, More than that, we rejoice in our sufferings, knowing that suffering produces endurance, and endurance produces character, and character produces hope. And hope is what I began to develop, hope for my Lord, as well as hope for my purpose. Just like all Christians who pursue it, the Lord was giving me a purpose much greater than any suffering and I began to know that my very suffering served a purpose. It wasn’t for nothing. Do you ever wonder about that. Your purpose? God was with me when I was laying on the pavement after smashing my body into the car when I had my accident. God was with me when I was in the emergency room and the intensive care in the hospital and the doctors told my parents I wouldn’t make it through the night. I couldn’t have come to Him at that point even if I had wanted to. He was there during my rehabilitation when everyone told me to just quit and accept my injuries. And He was there in 1991 after all of that, when he turned on that light and I saw the need to follow Jesus. He was there during my second surgery and lifted me up even more now that I was a follower of Christ, and then helped me through a bikeride that seemed impossible. And I’ve done many other rides since. I’ve competed 3 times in a 100 mile endurance race in 100 degree temps. And when I stumble and repent, His free grace restores me. He has been with me through many other surgeries, a four year bout with a life-threatening infection and some very mentally challenging times. November of 2014 brought knee replacement surgery, which then brought complications which has resulted in a 1 year plus recovery. As of the latest writing of this, I don't even know how it will end up. But I do know, a) I will say, "that's cool," when it's over, and, b) it will glorify God! It hasn't always been pretty. But I haven't been idle. 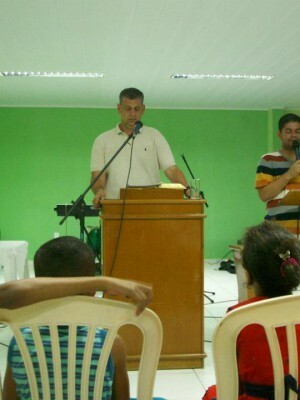 God has used me during these times for mission trips, evengelism, ministry, I've played in a praise band, and so much more. Sometimes, it's things that seem small but are large for Him. It's not because I'm great. Truth be told, I have some pretty significant weaknesses and character flaws. God regularly uses my weaknesses. It's obvious I couldn't do it on my own. That's what makes it awesome! It's about surrender, giving Him control and then letting others see so that they might have the same gift. He's always been there for me, picking me up when I am afflicted and restoring me with a new heart. And he’s been there for you! He’s been there through every trial and joy you’ve experienced. And for some of you, now is the moment He’s turned on that light and you see the need. You can't be good enough or give enough or be positive thinking enough or even christian-acting enough. Your works will NEVER change your life. You need a new and changed and growing heart and that, is only done by Jesus Christ. At a certain point, a precise moment, I had to have faith in something other than myself. I HAD to, in the rehab hospital, literally on complete faith, stand up and walk by trusting God, with virtually no understanding of Jesus whatsoever. As I grew in Christ, He expected more of me It's always challenging but, always fulfilling! That’s what I’m asking you to do. If that light comes on, or maybe you’ve been struggling about it for awhile, you need to stand up and walk and trust Jesus. Don’t put it off, that light can be turned off just as quick as it came on. Don’t be the me that denied Christ over coffee. God is calling you now...right now! Pray the very prayer that I prayed 21 years ago. It works just as good now as it did then. Don’t feel uncomfortable. Every Christian has made that decision at one time and it’s such a glorious thing. So come, rejoice with your brothers and sisters and take the free gift that Jesus has offered you. 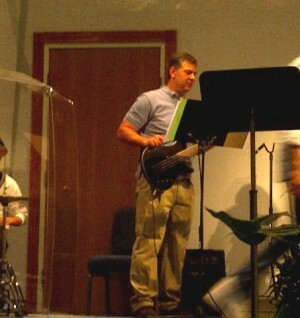 Pictures (L-R) Frank 1n 1988, months ofter his accident, 2003 in a 100 mile endurance race, preaching on a mission trip in Brazil, and, playing bass in his own church's praise band. continuing to serve even when he is forced back into a wheelchair in 2015. Our potential is another of God’s gifts to us!